together with the works of international artists of New York and Brussels. 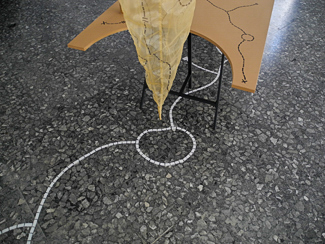 From October till end of December 2017: seminars, walks, talks, workshops, simultaneous with other Walking Labs in New York and Athens (Parsons - Fine Arts and Odeon - Conservatoire Athens), a creation lab and joint exhibition with CSCA Lab / European University Nicosia and Dance House Nicosia, Cyprus, with Sophie Gee and Arianna Economou. 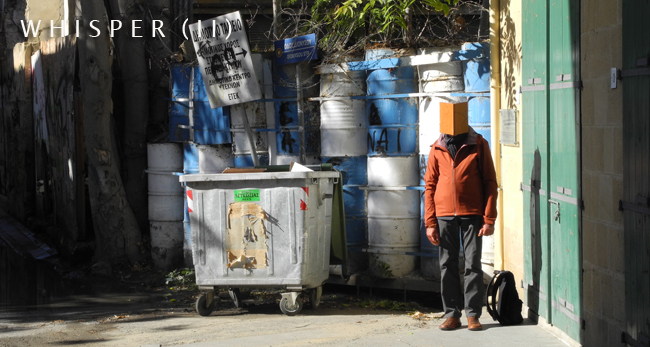 [Urban Emptiness Nicosia Festival] Nicosia Cyprus 01.12 > 10.12.2017. Performance / attribute Dancehouse Lefkosia Nicosia Cyprus 2017. Urban Emptiness Network. 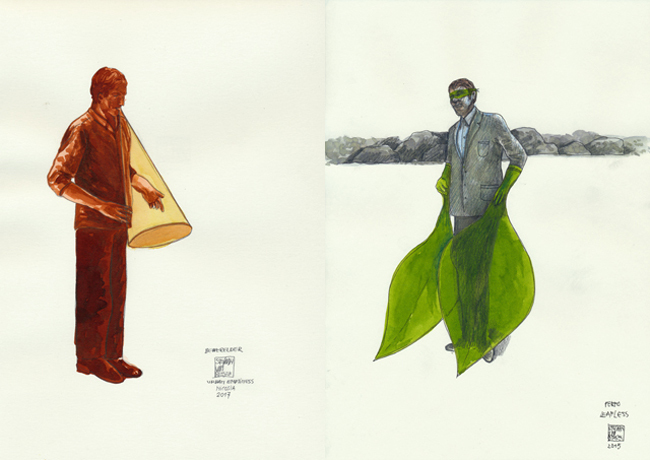 Leafless (I & II) Stefaan van Biesen / May Dalinsky / Anastasia McCammon at exhibition opening. Attribute made by Annemie Mestdagh. [Meander] Performance Faneromeni Square. Urban Emptiness Nicosia Festival 2017. Thursday 7th of December 2017. 11:00- 12:00 / Stefaan van Biesen. Performance at Municipal Market Nicosia (Performance). Whiff [Whispering] Paphos Gate Nicosia [Green Line] Urban Emptiness Nicosia Festival 2017 with Geert Vermeire. Camera & attribute: Annemie Mestdagh. Video, concept & soundscore: Stefaan van Biesen. Whiff [Whispering (II)] Urban Emptiness Nicosia Festival. Performance with walking participants 07.12.2017. [Urban Emptiness] Académie Royale de Beaux Arts Brussels Belgium December 18.12 > 21.12.2017.
in the frame of Urban Emptiness Network with the students/artists. Utopia [just around the corner?]. My 'Utopia Book': a silent drift for three walkers or more. New York 01.11.2017. Edinburg, Limassol, New York, Brussels, Athens & Nicosia, October/November 2017. [Utopia, just around the corner?] Limassol & Nicosia Cyprus February 2017. Utopia. A book of longing. During the Urban Emptiness Network exhibition at NeMe Limassol Cyprus. Following on walks and interventions in Limassol and Nicosia February 2017. Curated by Geert Vermeire. Book by Annemie Mestdagh & Stefaan van Biesen. Project started as a pilot in Braga Portugal December 2016. Photo's (of the walks and interventions by Stefaan van Biesen and Annemie Mestdagh) : Marielys Lely Mendelez (Porto Rico) walking with us in the devided and occupied city of Nicosia. 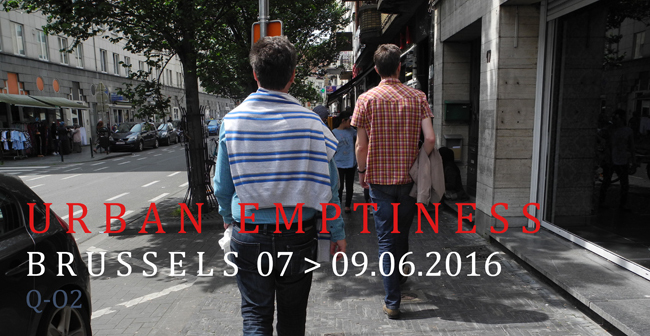 The project Urban Emptiness suggests an interdisciplinary investigation of emptiness and silence in three contemporary cities: Athens, Edinburgh and Brussels. The aim is to highlight the importance of real and imaginary/hidden landscapes in the urban environment and explore different conditions of intimacy in their understanding. 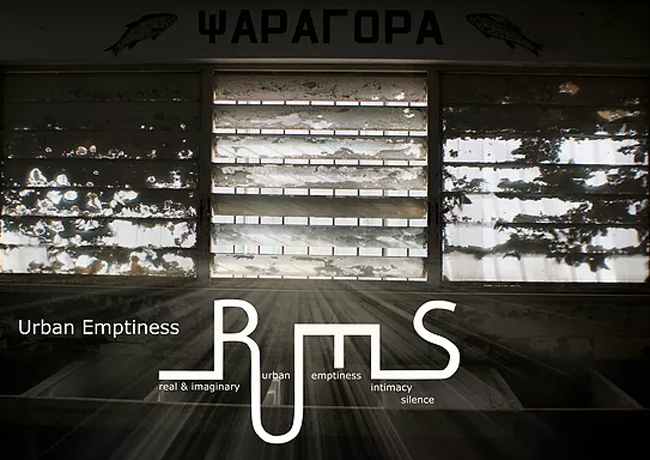 Through three main actions that involve different methodological strategies (workshops, performative projects, open discussions and exhibitions), the project intends to contribute to the discourse about the social, educational, financial, ecological and cultural value of an experiential/performative understanding of silence and emptiness in urban life. Acknowledging the significance of the contribution of diverse groups of people in its results, this pilot study invites university students and local citizens in its actions. NeMe Arts Centre. 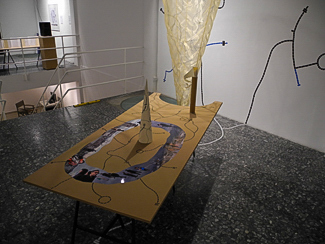 The exhibited works were created within walking exchange projects between students of Cyprus University of Technology Limassol, Faculty of Communication and Media Studies (led by Dr. Angeliki Gazi & Dr. Yiannis Christidis), the University of the Aegean, Department of Cultural Technology and Communication (led by Dr. Nikos Bubaris), the Parsons New School of Design, New York (led by Dr Lydia Matthews), Drama School of the Athens Conservatoire (led by Adonis Volanakis), RITCS School of Arts – Radio Dept Brussels (led by Dr Guy Debievre), National Technical University of Athens – School of Architecture (led by Dr Georgios Parmenidis, Dr. Nelly Marda and Olga Ioannou), Edinburgh College of Arts – ESALA (led by Dr. Christos Kakalis, Stella Mygdali) and Marielys Burgos Melendez, Stefaan van Biesen, Geert Vermeire, Ismini Gatou, andromachi Vrakatseli. 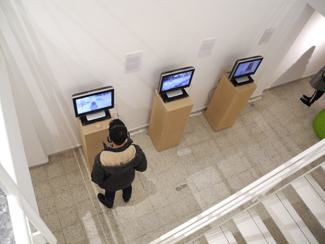 Documentation of the media walks created by the participating artists mentioned above will also be part of the exhibition. Further works have been created by the Cyprus based artists: Elena Pillakouri, Evdokia Georgiou, Maria Andreou and the Mind The Gap Coollective. Venue: Pefkios Georgiades Auditorium, Cyprus University of Technology, Limassol Cyprus. 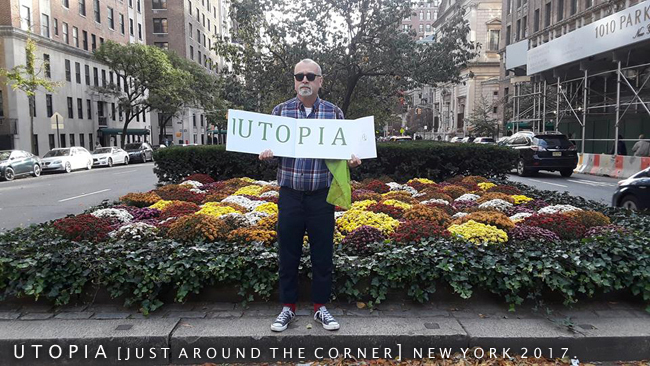 [Utopia * just around the corner?] NeMe Limassol Cyprus February 2017. The Utopia Book. 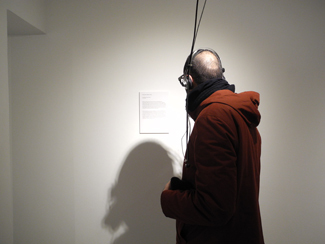 Helene Black (NeMe) in Limassol, Cyprus, reading a book of longing during the Urban Emptiness Network exhibition at NeMe. Following on walks and interventions in Limassol and Nicosia February 2017. Curated by Geert Vermeire. 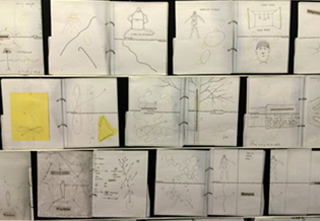 Book and walks by Annemie Mesrdagh, Stefaan van Biesen and Geert Vermeire. Video and camera by Stefaan van Biesen/the Milena principle. [Sensing Silence] NeMe Arts Center Limassol and Dancehouse Nicosia Cyprus February 2017. Sensing silence the Diogenes variations a video about the performance by Geert Vermeire and Stefaan van Biesen [the Milena principle] with a complementary workshop about silence and the body in the empty EMST National Museum of Contemporary Art in Athens by Geert Vermeire (performance artist), Stefaan Van Biesen (visual artist), Christos Kakalis (architect) and Andromachi Vrakatseli (sound artist). Departing from the interconnection of sound and walking as a research method and artistic practice we explore the relation between movement, body and sound in the silent spaces of the empty museum, using recording technology, drawing and writing as tools to capture trajectories through silent space.In the frame of the Urban Emptiness Network - Edinburgh-Brussels-Athens 2016. The workshop was organized in collaboration with EMST National Museum of Contemporary Art and curator Ms. Anina Valkana as part of the Museum's educational programs continuing on the educational program "Young Sound Explorers» Co-organizer: EMST National Museum of Contemporary Art, Athens Partners: DEREE-The American College of Greece / Theatre Arts & Dance Department Athens School of Fine Arts National Technical University Athens / School of Architecture Urban Emptiness Network - Edinburgh-Brussels-Athens 2016 / the Milena principle 2016. Camera & © video by Annemie Mestdagh and Stefaan van Biesen. For the first time this video was shown at the NeMe Arts Centre in Limassol during the exhibition Urban Emptines Network and in the Nicosia Dancehouse in Nicosia Cyprus. The presentation acts as an invitation for artistic participation by young dancers, young performers and young artists, designers and creatives of all discipline to engage in interactions with the city and public spaces. 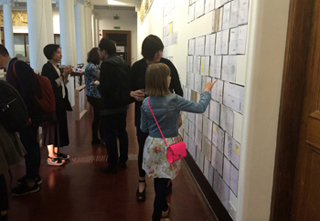 Attendance is advised for all artists interested to contribute to this international project. For this reason an open call will be launched shortly and will be introduced during the presentation.